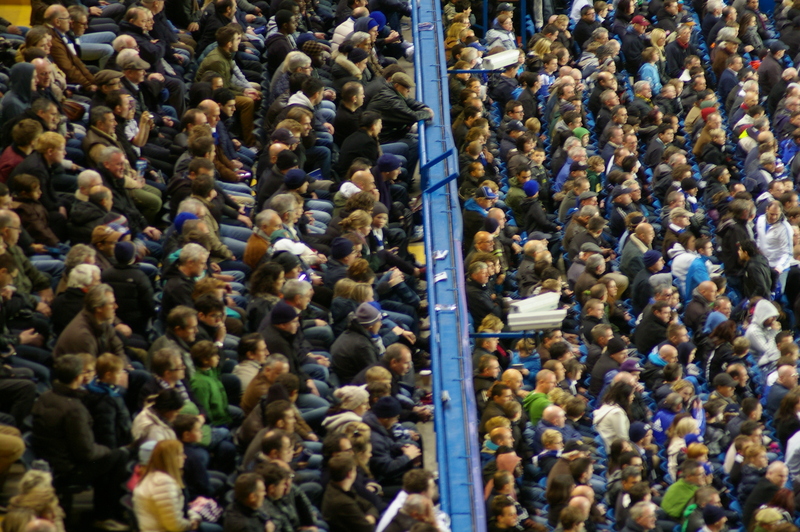 Chelsea vs. West Bromwich Albion : 13 January 2016. When I first started penning – or rather typing – these Chelsea match reports, firstly on a rather ad hoc basis, in around 2006 on the “Chelsea In America” website, there was one word which tended to be mentioned with ever more increasing regularity. 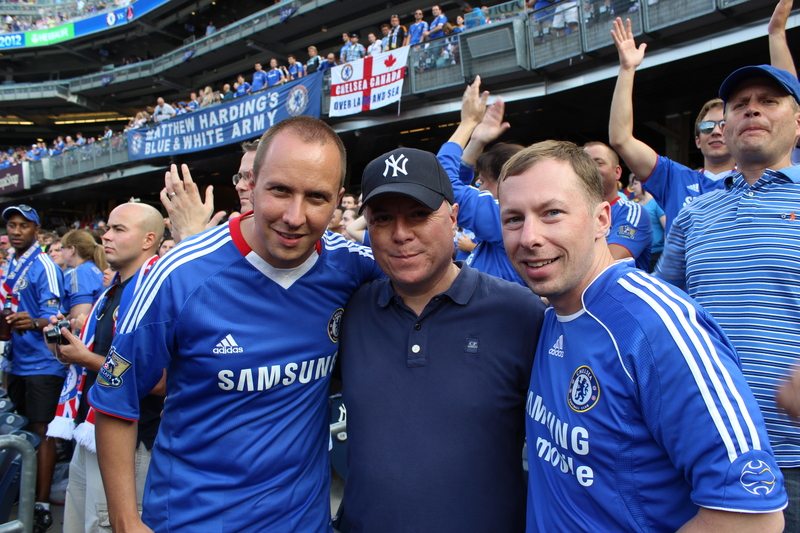 For those folks on the other side of the pond, as the old cliché goes, who had never been lucky enough to be able to attend Chelsea games in person, I received many positive comments which thanked me for allowing them to live vicariously through my personal detailing of my match day experiences. It is a word that still occasionally pops up to this day. Ahead of our midweek match with the Baggies from West Bromwich, I was well aware that for a few hours there would be a certain amount of role reversal taking place. Charles, a Chelsea supporter from the Dallas area of Texas, would be attending his first-ever Chelsea game at Stamford Bridge, and I had planned to meet up with him before the game. I first met Charles in his home town for our friendly with Club America at the spanking new home of the Dallas Cowboys in 2009, and we have chatted on line about many aspects of football and fandom on a regular basis. In addition to being a Chelsea supporter, he is an FC Dallas season ticket holder and he attends the occasional away game too. We both work in logistics – and Charles loves foreign travel, and has written of his experiences on a personal blog too – so we have a few things to talk about outside of Chelsea. I last bumped into him in Charlotte in North Carolina over the summer. Although he has visited Europe twice before – Italy – this would be his first trip to England. He arrived on the morning of the game. I soon sent him a message. As I muddled my way through my shift at work, I wondered what Charles would be making of the alien streets of London. The new architecture, awkward accents, different streetscapes, a brand new buzz. I was, oh most definitely, jealous of him. There is nothing like, in my mind, a first few hours in a new country, town or city. His first few comments back to me were revealing. And indeed it is. Very diverse. And our current team mirrors it. Belgium, Spain, England, France, Brazil, Serbia, Bosnia, Italy, Ghana, Senegal, Nigeria, Burkina Faso, Colombia. The day’s work completed, I met up with PD and Parky. PD was taking a turn to drive and I could relax. We were in the middle of three home games in seven days and an evening with The Great Unpredictables was waiting for us in London. In The Goose, the usual suspects were assembled. We were all very happy with our F.A. Cup pairing with either the Cobblers of Northampton Town or the knobheads at Franchise FC. As we stood in our corner of the pub, it was confirmed that our game would kick-off at 4pm on the Sunday. This was met with predictable groans. It would mean that I would not get home until around 9pm that night. Charles had made his way to Fulham Broadway and then ‘phoned for directions to pub. He sounded rather tired. I suspected that the jet-lag was having an unfortunate effect. He arrived fashionably late, at just after 7pm, but it was lovely to be able to welcome him to The Goose. I had a pint of trademark “Peroni” waiting for him and then introduced him to a few mates. Before we knew it, it was time to head off to the game. Such a fleeting pre-match, but Charles is in town for the Everton game too, so there will be another chance to serve up some Chelsea hospitality then. I was well aware that Charles had a ticket in the corner of The Shed. His front row seat was the stuff of dreams. 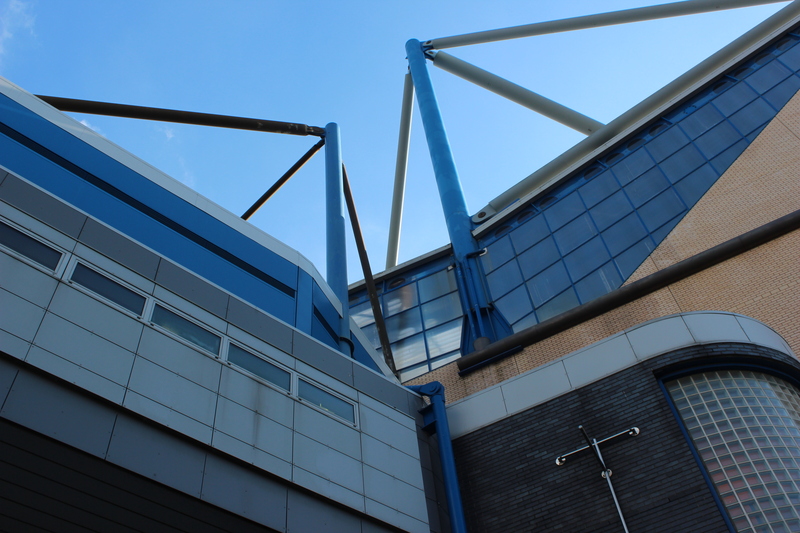 Outside the West Stand, we wished each other well. The Matthew Harding soon let them know their feelings. To be honest, the gaps in the south-east corner were matched by many empty seats in the home areas. In just the immediate area of where our season tickets are situated, I counted ten empty seats. Over in the south-west corner, I soon spotted Charles. He is well over 6 feet tall. He is easy to spot. He was standing no more than five yards from Parky. Towards the seventeen away fans in the Shed Upper, a large “Chelsea Poland” banner was spotted on the balcony wall for the first time. Guus Hiddink had finely-tuned the team since Sunday. In came Thibaut Courtois, John Terry and Jon Obi Mikel. When we arrived in London at bang on 6pm, the weather was milder than I had expected. By the time of kick-off, there was a chill to the air. The lights dimmed again, and there was the dramatic entrance of the teams once more. “The Liquidator” echoed around the stadium. There was a bright start from both teams, but Chelsea got into their groove quicker than the red-shirted visitors. Diego Costa, blasting ridiculously high into the Shed Upper, and then Willian wasted good chances. But then the visitors went close too, with chances arguably better. Thankfully, we escaped unpunished. On twenty minutes, we were treated to a fine move. Cesc Fabregas picked out Diego Costa who controlled the ball well and fed Willian. He passed outside to the advanced Branislav Ivanovic, whose low cross was turned in by Cesar Azpilicueta. It was a magnificent move and Stamford Bridge ignited. As I spotted Dave running across the goalmouth and towards the corner, I knew that I had to capture the moment. I snapped away as Dave leaped, rather awkwardly, before being met by his team mates. My pre-game comment to Charles was prophetic. There were the celebrations. And there was Charles, capturing the moment on his phone. A perfect moment. For a while, we played some lovely stuff. Maybe we were buoyed by the goal, but I noted a greater willingness to play the ball early. There was movement off the ball. There was a little more energy. I spotted Dave make some excellent blind-side runs behind the West Brom defence, but the playmakers were unable to spot him. Diego Costa was holding the ball up well. Fabregas almost played the pass of the season. Ivanovic put in a few more good crosses. We were playing as a team. This was good stuff. And then, West Brom bounced back a little. Their new found confidence was rewarded when Pedro, the one who was yet to shine, weakly gave away the ball around the halfway line. Fletcher fed in Gardner, who was able to advance before unleashing a low drive from outside the box, which disappointingly crept in to the goal, just inside the post. A couple of chances were traded before the break. Although it had been a reasonable first-half of football, the atmosphere was sadly missing. The temperature was dropping further, and although most fans in the lower tiers behind both goals were standing, the noise was poor. There were songs from The Shed on occasion and I was sure that Charles was joining in, but there was no cauldron of noise which we are occasionally treated to at Chelsea. Pat Nevin was on the pitch at half-time, chatting away to Neil Barnett. Talking of barnets, Cathy had posted a link on Facebook during the day which detailed Pat’s recent hair transplant. This was a really strange story; of all the people who I would have suspected to eschew such cosmetic procedures – vanity, in a word – it would be Pat. The world is a mighty strange place. Hiddink replaced the poor Pedro with Kenedy at the break. He immediately impressed, shooting on sight from way out. The kid from Fluminense has great energy. One of my current workmates is from Brazil – a Palmeiras supporter, in case anyone is wondering – and Bruno has a younger brother who is a promising footballer. He is currently staying in London and training with Chelsea, with hopes of signing a contract. He once trained with Kenedy in Brazil at a training camp hosted by a club. Who knows, if things go really well, Bruno’s eighteen year old brother could soon be playing for Vitesse Arnhem. The referee then became the target of our ire. He had – in the eyes of some, maybe not me – blown for the end of the first-half just as we were breaking away, but then chose not to issue a second yellow card to Yacob for a trip on Diego Costa. Willian curled over from the resulting free-kick. This was turning in to a feisty encounter. The crowd were suddenly the noisiest for the entire night. I wondered if Charles was able to decipher the London accent. The temperature dipped further, and now rain fell. I wondered if Charles was getting wet in the front row. All part of a typical London experience. Temperatures were rising though in the home stands as West Brom seemed to be time wasting. Their goalkeeper Myhill – a fat Jack Whitehall – was booked as he waited for a team mate to put his boot back on. The referee, hardly flavour of the month, booked others. It was a niggly old game. We struggled to create too much in a poor second-half. Oscar and Fabregas seemed distant. Elsewhere others were struggling too. Zouma, so dominant in the air, found himself out of position and struggling on the ground. Myhill was still getting it. Then, the ball was moved out to Willian, always looking to gain a yard, and he spotted the movement of Kenedy. From behind a grassy knoll, he whipped in a troublesome cross. In a flash, Kenedy lunged at the ball and it flew in to the net, squeezing past the loathed Myhill. Kenedy ran off to celebrate in the far corner, and was joined by many others. Alan suspected an own goal. I was not sure. Regardless, we were winning. There were just fifteen minutes remaining. Costa went close again. But then the visitors came at us again. Matic, masked like Dave, replaced the poor Fabregas. The minutes ticked by. We seemed to be at risk with every West Brom attack. The place became nervous once more. With just five minutes remaining, a loose ball fell to the equally loathed James McLean who crisply dispatched the ball past Courtois and in, again creeping in by the foot of a post. We collectively crumpled. If anything, the visitors seemed more likely to grab a – unwarranted – winner. In the end, the final whistle was almost greeted with relief. On walking back to the car, I chatted to PD. I am sure that Charles had enjoyed himself, though. And, again, I had enjoyed sharing his evening in deepest SW6. It had been a vicarious evening if not a victorious one. This bloody strange season continues. Everton at home on Saturday. On we go. Well, I won’t lie. After all of the travelling to and from Germany, I would have preferred the League game with Wolves to have been taking place on the Sunday. Saturday was just too quick. Too soon. I think that my head was still over in Germany. You know how it is when you go away on holiday. It takes a while to adjust and get back to normal. Then there was the dark cloud hanging over everyone at Chelsea. The fact that we are going through a dip in form certainly did not help. The alarm sounded at 6.30am and I struggled to get out of bed. I called for Lord Parky and we were on our way. I told him of my malaise and he knew how I felt. He was under the weather with a head cold and we both spent the first few minutes a-mumbling and a-grumbling about our recent run of poor form. Parky has such an infectious personality though – don’t tell him I said so – and so it didn’t take us long for the melancholy to subside and for us to get back into our stride. We were soon making silly quips and puns as I drove to London. I relayed a few stories from my few days in Germany, too. The time soon passed. Straight into the Yadana Café on Lillee Road and a Super Breakfast. Then, around the corner to The Goose. We heard on the grapevine that there were loads of spare tickets floating around for the game. The pub, actually, seemed quieter than usual. There was quite a showing from the North American continent in The Goose. Beth, Josh and Andy were in already – plus the four Beltway Blues who had travelled to Leverkusen; Stephen, Lizabeth, Allison and Cassie. Mike and two of his members from the New York Blues suddenly appeared out of nowhere and then none other than Gumby joined the fold. I limited myself to just two pints as I was driving. The days of having five or six pints before games seem a long way away. I made my way to The Bridge and walked towards the turnstiles for the Matthew Harding, with the montage of the West Stand wall to my left. My good mate Andy often goes to watch Rangers north of the border. The reasons for this are many and varied, but I remember his comment that the game in Scotland still exudes a working class feel, with allied atmosphere and noise levels. Andy goes up to Ibrox around five times each season and has got to know several Bears. He had contacted me about freeing up my mate Glenn’s season ticket for the Wolves game for one of his Rangers mates. Part of the deal was that I watched the match from the opposite corner of the Matthew Harding, while Andy sat with Davie alongside Alan in The Sleepy Hollow. I didn’t mind that at all. In fact, I jumped at the chance to see the game from a different perspective. I took my seat in Gate 15 – two rows from the back, just in front of Daryl and his mate Chris from Guernsey – just as the Chelsea flag ended its course of travelling above the heads of the spectators in the Upper Tier. I quickly zoomed in on the Upper Tier of The Shed and took a photograph of the Americans and Canadians in Gate 4, just above the goal defended by Wayne Hennessey in the Wolves goal. Yes, there was a substantial amount of surprise in the ranks that Drogba was again starting ahead of Torres. Lampard was on the bench too. The mood amongst the nearby supporters was of typical Chelsea cynicism at the start. I had said to a few friends that the game might turn out to be as enjoyable as a trip to the dentist’s. We opened brightly and a spirited dribble from Ramires after just five minutes resulted in a low shot which Hennessey did well to turn around his right post. From the corner in front of the 1,500 Wolves fans in the south-east corner, John Terry rose and headed the ball down and in to the Wolves goal. I clicked away as the captain was joined by several team mates and watched through my lens as he raced towards the Chelsea bench. He stopped short of the manager, though. I noticed that Villas-Boas was almost ignoring the advancing players and was instead gesturing across to other players, concentrating on the job in hand. Soon after, a low cross from Ivanovic was met by Juan Mata but the effervescent Spaniard blasted over. A great move down the left resulted in Mata skipping past several lunges from desperate Wolves defenders. He slotted a low ball across the six yard box for Daniel Sturridge to slam home from close range. It was a goal reminiscent of Studge’s equaliser against the Scousers – although it was not celebrated quite so wildly. Sturridge then had a drive which was palmed over. I admired the way that Drogba controlled a high ball on the halfway line. He then advanced before pushing the ball back to Ashley Cole who swept the ball into the path of that man Mata. A crisp and instinctive finish and we were three up and coasting. To be honest, it was all Chelsea in the first-half and the visitors were unable to ask many questions of our under-fire defence. From my viewpoint high up in the corner of the MHU, I was able to see how John Terry often played the ball through to Mata and Cole. Our best moves often came down the left. In the middle, the composed Romeu looked settled and put in a fine performance. It was noticeable how often Mata left his left-wing berth and came inside in search of the ball. I met up with San Francisco Pete at half-time and – for once – there were no moans. We both agreed that we would quite happily take the 3-0 scoreline. We both realised how important it was to keep a clean sheet. Despite the pleasing performance in the first-half, the atmosphere in the Matthew Harding was pretty woeful. To their credit, more noise seemed to be coming from the opposite end, and the Shed Lower appeared particularly animated. Down in that fat corner, Parky and Andy Wray were but 15 seats apart. I was enjoying being able to watch a Chelsea game from a different part of The Bridge. I had watched a few games from that corner before. I was able to take plenty of photographs of the game, but I was also able to pick out new angles of the four stands too. I could hardly believe how many seats were not used in the expensive tier in the West Stand. I noted all of the differing supporters’ club banners in the West Stand. Ramires tested Hennessey after 50 minutes with a looping effort from the inside-right channel. Our little Brazilian gem was having a fine game; tons of energy and enthusiasm. On 52 minutes, David Luiz seemed flat-footed and allowed Stephen Ward a shot on goal, but Cech was untroubled. Daniel Sturridge then made a super run from deep right down below me and advanced to within eight yards of the goal. His final pass across the goal was awful, though. Wolves had a little spell of possession and forced Cech to scramble two efforts away within five seconds. It would be there last real efforts on our goal. Villas-Boas rang the changes with Lampard coming on for Meireles and then Bosingwa and Torres replacing Ivanovic and Drogba. The Torres one we understood. The Bosingwa one not so. Oh well. He’s the manager. It wasn’t as if the game was on the line. Torres looked keen in the final fifteen minutes and we certainly willed him on. But he still looks leggy and low on confidence. I hope he starts on Tuesday. The most bizarre part of the day’s play was John Terry taking ages for a throw in over on the far side. He was unsurprisingly booked and I couldn’t believe what I had just witnessed. With hindsight, it appears that it was all very intentional. On the drive home, Parky and I both admitted that Wolves had been poor, but we were just so grateful to evade our first three-game home losing streak since 1993. We are not out of the woods yet, but let’s build on this. As I raced home, we listened to some classics from Kraftwerk, that seminal band from our youth. It was quite clear that Germany was still lingering in my thoughts. The games are coming thick and fast with hardly a pause for breath. Liverpool next – and there is revenge in the air.